In what direction should the education pipeline flow? For most of us, education took place in a traditional classroom setting. Teacher at the front of the class lecturing or reading along out of the textbook, deciding what is taught, and when, sticking to the lesson plans and schedule. No wonder we talk about education as if it only flows in one direction—from the teacher to the student. “What’s wrong with that?” you ask? For starters, in this scenario, the student is passive while the teacher does all the heavy lifting. It cripples the student and exhausts the teacher. Critical thinking requires the student to become conscious about their thinking; self aware and purposeful in their thought processes. Along with acquiring knowledge, students must learn to distinguish fact from feelings and inner desires. They need to know how to avoid logical fallacies like straw men, ad hominem, ambiguity, presumption, false dilemmas, and circular reasoning. They can practice their critical thinking skills by deconstructing a story, an article, an argument, and responding intelligently to the presentation of information as well as underlying issues. Critical thinking also cultivates a sense of integrity, and encourages young people to root their thinking in honest research, sincere discernment, and straightforward communications. Critical thinking does not develop simply from instruction—it must be exercised regularly; assumptions challenged, debates engaged, and students exposed to a variety of material. Self discipline requires the student to asses their weaknesses and create a strategy for making good decisions. Habits develop like maintaining a schedule, turning in assignments in a timely manner, and prioritizing tasks. It’s practice for their critical thinking skills; differentiating between needs and desires, facts and feelings, and reacting appropriately to a variety of situations. If a student’s choices are limited and their priorities set for them, they have little chance to develop the ability to act and react appropriately, or the opportunity to learn from their mistakes. Teamwork helps our children develop essential interpersonal skills, as well as learning how to organize tasks in a group setting. Children can appreciate how the talents and strengths in a group of individuals makes working together toward a common goal exciting. They also need to understand that the quieter, detail-oriented members of a group are still able to contribute as much as the more demonstrative and vocal members. Experiencing the strengths and weaknesses of each member of a group allows children to learn the ways we can complement each other. In this way, teamwork can foster confidence as well as humility. Diversity is important here, because dealing with different points of view limits “groupthink” and the desire to live in an echo chamber with self-sealing beliefs. Creativity is sometimes viewed as a luxury, and even as a waste of time. But the imagination can be expressive and useful. The application of information to a variety of situations is sometimes referred as a transfer of learning; when students can take information gathered in one context and apply it in another. It is essential for problem solving across every subject and discipline. For instance, taking concepts learned in math class and applying them to science experiments, or applying what was learned in Creative Writing to a history report. A student who is not allowed to exercise creativity may have trouble transferring what they've learned in school to a vocational setting, because they’ve never been allowed to experiment, or make mistakes without being disgraced. Very little time is allotted in schools for children to be creative, to take art and music classes, to explore their writing talents, and teachers must ensure that students are completing assignments as per specific instructions. Perseverance develops as a child recognizes their responsibilities, and is able to accomplish work in a timely and thorough manner. A work ethic can be strengthened as the student’s awareness of their place in the world grows. They grasp that being in part of society carries a certain amount of obligation with it, such as being trustworthy and dependable. Learning how to work through obstacles, even physical and mental ones, further improves their endurance and tenacity. In the traditional classroom, much of the ‘work’ is actually completed by the teacher. Plans are made, lessons are predetermined and written out, a selection of questions are at the end of the chapter—and the answers to these questions are invariably highlighted in some way. The teaching does most of the talking, and time constraints seldom allow a deeper exploration, so students remain passive and are able to do very little in order to reach the ‘average’ that will allow them to pass and graduate. Even teachers are unable to exercise their own critical thinking, creativity, and teamwork, and all too often, their jobs hinge on pushing through curriculum to prep for tests. What is even more of a concern is when their incomes and job evaluations depend on those test scores. I don't envy teachers this rock-and-a-hard-place dilemma, and I'm sorry that instead of being allowed to use their hard won teaching skills, they are duct taped to federal stakes and roasted over a critical media fire. This should all serve as a lesson to parents. The local school is doing what they can to provide an education, but it is up to parents to ensure that their children are actually learning. Homeschool parents in particular need to understand that they can leave behind lectures and textbooks in favor of quality reading material, experimentation, exploration, research, debate, and discussion, and feel confident in their choice to educate their children outside of the traditional school box. A solid 21st century education can be obtained by the free-flowing exchange of ideas, instead of straining information through textbooks, which are seldom more than a series of brief informational sound bites. But don't get me wrong—textbooks can be helpful for creating a scope and sequence, as well as using chapter questions as writing prompts and research topics. Learning how to use textbooks as one small brick in their academic foundation will give students an advantage when they are sitting in a college classroom or taking an online course. But the dependence on traditional textbooks, with the read-the-chapter-answer-the-questions format robs the child of the ability to form core competencies that build a well-rounded student of good character. And now for the sticky wicket—teaching critical thinking, self-discipline, teamwork, and perseverance means modeling these characteristics. That’s where the education pipeline tends to get clogged. Parents and teachers must show, and not just tell. This could mean a parent basically becomes a student alongside their children. Few parents want to go ‘back to school’, but this time it’s for your kids. Not because you are obligated, but out of love. None of us have arrived to the point where we have no more growing to do as a person or a parent. Teaching your children, whether they are enrolled in school or are homeschooled, opens up a world of learning and character building for the parent. As the learning flows both ways in their home, children will see humility and hard work exemplified by their parents. Why not be an inspiration to your kids, instead of just the person who gripes at them to wipe their feet or brush their teeth? Parents have the incredible opportunity to engage in the education exchange, and instill in your children a deep-rooted love of learning anchored to a solid academic foundation. 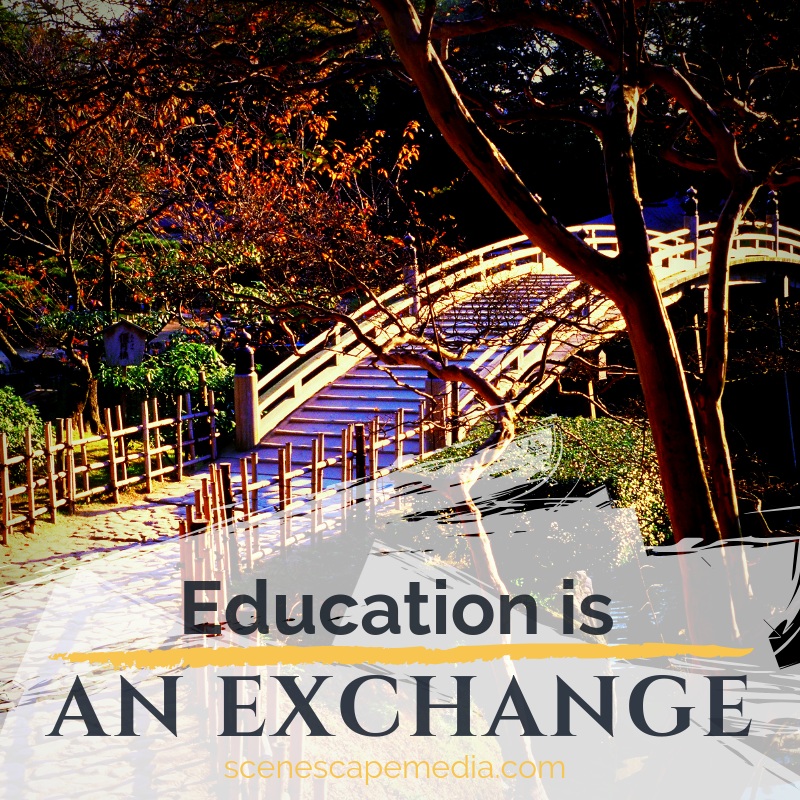 What do you think about education as an exchange?